Upland women weed their rice fields, an integrated method of agro-forestry in Mokpon Village, Laos. Investing in healthy forests is not only vital for human and environmental well-being but also crucial in the transition to a low-carbon, resource-efficient green economy, says the United Nations Environment Programme (UNEP). Over a billion people worldwide depend on forests for shelter, jobs, food, water, medicine and security. Forests also serve as carbon sinks and stabilize global climate, regulate water cycles and provide habitats for biodiversity while hosting a wide variety of genetic resources. “Forests provide essential services to all of us,” said UNEP’s Tim Christophersen, Senior Programme Officer dealing with forests and climate change. “It has a lot of multiple benefits for the work that we do for livelihoods, for water security, for food security, for landscape management and also for agriculture,” he added in an interview during the tenth session of the UN Forum on Forests (UNFF10) in Istanbul. Yet despite the myriad benefits derived from forests, they are still being destroyed at a rate of 13 million hectares annually, according to UNEP, which stresses that investing in forest management and reforestation activities could contribute significantly to the transition to a green economy – one that is low carbon, resource efficient and socially inclusive. “Practically speaking, a green economy is one whose growth in income and employment is driven by public and private investments that reduce carbon emissions and pollution, enhance energy and resource efficiency, and prevent the loss of biodiversity and ecosystem services,” the agency stated. Investing in forest management and reforestation, it added, would also reduce the vulnerability and risk posed by increasing climate change. The UN Collaborative Programme on Reducing Emissions from Deforestation and Forest Degradation (REDD+) – joint venture by UNEP, the UN Development Programme (UNDP) and the Food and Agriculture Organization (FAO) – seeks to create financial value for the carbon stored in forests, offering incentives for developing countries to reduce emissions and invest in low-carbon technologies to sustainable development. He noted that REDD+ is not a “hands-off approach.” It focuses both on conservation as well as on improving sustainable forest management. Among the projects connected with REDD+ is a programme called Socio Bosque in Ecuador that provides funding to forest owners and communities to better manage their forests. The programme was launched in 2008 with the aim of conserving over five million hectares of forest, avoiding 13.5 million tons of carbon emissions per year and providing additional income to more than two million poor people in the country. 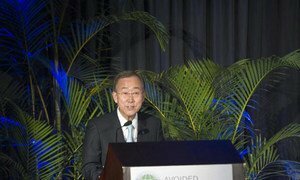 Secretary-General Ban Ki-moon called today for increased support from Member States for a United Nations initiative to slow, halt and reverse deforestation, and help developing countries manage their forests in a sustainable manner.